Lexus has revealed its all-new LS luxury saloon, which should be available to order before the end of 2017. Prices are to be confirmed, but expect them to start at around £70,000 to compete with the Mercedes-Benz S-Class, BMW 7 Series and Audi A8. 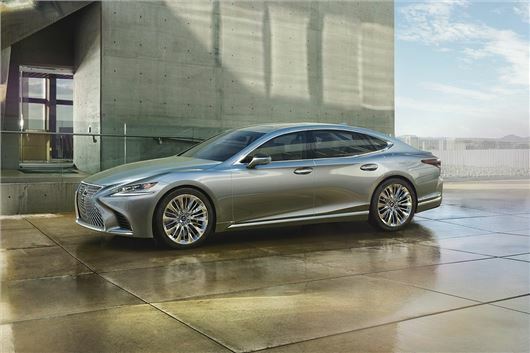 The new car sports the latest Lexus styling cues including a large, wide grille and plenty of sharp lines, hinting at a sportier personality. In fact, Lexus promises “engaging performance” and “emotional design” – but it is still keen to reinforce that this is a quiet, comfortable and relaxing car. Power comes from a new 3.5-litre twin-turbo V6 petrol engine, producing 420PS and 600Nm of torque. Drive is via a 10-speed automatic transmission, recently launched in the Lexus LC coupe. This is the only announced engine option, but there’s a good chance a hybrid will be available too. The front seats are available with 28-way adjustment, so almost anyone should be able to find the perfect driving position, plus there are heating, cooling and massage functions. Lexus also claims that the driver can operate all controls without changing their posture. Rear seat occupants get heating, ventilation and massage functions for their seats, too, plus there is an enhanced rear seat package for those who prefer to be driven than to drive themselves. With this, one of the rear seats reclines up to 48 degrees and can be raised. Up front there is 12.3-inch navigation display and a full range of connectivity features. Optionally there’s a huge 24-inch head-up display too, to project information into the driver’s line of sight. Other technologies on offer include an advanced driving support system to improve safety on motorways.